We are excited! We made our first iMovie on geometric shapes found around the playground and classroom! We hope you enjoyed our video! We learned our world is filled with geometric shapes everywhere! Taking pictures horizontally will allow pictures to be edited easier and will look better on screen. We need to make sure the colours and font we select will be visible and clear when the video is played. Editing photos too many times can cause the photo to become distorted. We learned how to use the app called Over. What a great photo editing tool! What would you say to Terry Fox if he were still alive? 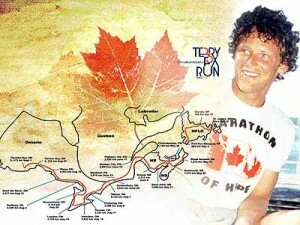 My Grade Four students wrote a letter to Terry Fox. Click the link to read the letters.